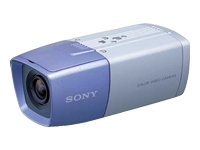 The SSC-CX18VP analog color video camera is ideal for commercial facilities; such as, department stores, shopping malls, retails shops, museums and banks. Offering high performance, easy installation and an excellent cost performance ratio, this camera is the right choice for a wide range of surveillance applications where unobtrusive CCTV monitoring is required. Because the camera is equipped with an integrated 1/4 type vari-focal lens, you don't need to spend time and money on choosing and installing a lens. It includes an auto iris and automatically adjusts to fluctuations in extreme light levels. With a focal length from 2.8 to 5.8mm, the camera is capable of covering a wide range of viewing angles. Simply lift a small cover on the top of the camera to adjust the focal length. For a quick and easy installation, tripod-mounting holes are provided both on the top and bottom of the camera body.